Lorenz' book "Journeys to Lost neighbors. 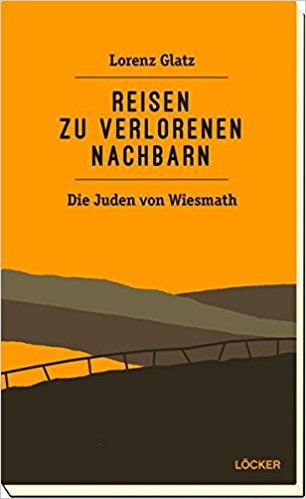 The Jews from Wiesmath" has been published recently and so there will be a number of presentations in the months to come. It's important to remember what's happened in Austria in 1938 and Lorenz has done researches in his home village and abroad in Israel and USA. We did it by travelling with Servas. So it's also interesting for Servas. The book will hopefully be translated in english. At least two people of the next generation seem to be determined to check this. I attach a text written by our Jewish Servas member Renee Chinquapin from New York who was among the first to read the book. In the meantime there were two representations in schools, two in Vienna and above all one im my village, all in somehow different ways but everywhere in front of very interested and sympathetic people. The Nazis obviously had preferred to stay at home and didn't dare to show up. In Wiesmath (the village I was born in) we had an audience of 120 people, nearly the double number of what we had expected and prepared for. And there will be at least four more lectures the next three months. That's not so bad if one thinks that the book is about what had happened in a small village in Austria's outback. On the other hand, however, the history of so many others in so many more villages and towns is quite the same ugly and brutal story. As for Renee's text "The Good Goy of Wiesmath" her praise of me is somehow embarrassing for me since it took me so many years to look at and pick up the story and I really didn't risk anything writing and telling it now. Nevertheless the four old ladies who still were alive ten years ago and some of the next generation wanted me to write down "their story" even so late to prevent it from being forgotten. The knowledge of the German language however is dying with the old generation so that the younger ones (mostly at least in their sixties) even want to have the book translated at least into English. We'll see. Renee doesn't only allow but definitely wishes the text to be published by you. so if you decide to do so you may do it any time. חבר סרווס אוסטריה LORENZ GLATZ ואשתו HEDWIG SEYR-GLATZ כתבו לנו על הספר שלורנץ כתב על מסעו בעקבות שכנים אבודים, שכניו לכפר ילדותו, בנסיון לאזכר את שארע באוסטריה במלחמת העולם השניה. כחברים בסרווס אוסטריה, הם ערכו את מסעותיהם בישראל ובמקומות אחרים כשהם נעזרים בחברי סרווס בכל מקום. מצורפים בזה מכתביהם לסרווס ישראל וכן מכתבה של RENNE CHINQUAPIN מארה"ב המצרפת את רשמיה מהספר.